Held every year on Labor Day weekend, the CBMM auction attracts folks who want to see what there is to bid on this year. I watched a woman in a bidding war with a young man over a pre-WWII rowing skiff. He got it for $750. I went to the charity boat auction this weekend at the Chesapeake Bay Maritime Museum. It was the 21st year of the auction. A lot of boats of all sizes and types were on display and each was sold through auction. A Flying Scot sold for $700, and an older Lyman runabout went for $2400. And everything else got sold for something. Some were a steal, others were junk. Which got me thinking of something that has been a topic of discussion among my friends. We all know someone with an old boat, sail or power or other, that is worth next to nothing. What do we do with old boats? Soft decks, rusted trailers, a title lost long ago, engine frozen solid, decay, rot, loose paint..you know what I mean. The back of every boat yard has them, sadly living out a worthless existence, providing no joy to anyone. What would you pay for a 1977 Zodiac inflatable? Who would keep such a thing around? Almost as crazy as last year's engine guy selling old outboards. Buy a British Seagull and get a second Seagull for free. I kid you not. I plan to talk after the Labor Day holiday with the boat donation program manager at the museum, Todd Taylor, to get some ideas to pass on about getting rid of that boat your father once loved. He passed away and no one knows what to do with it, so it sits. A tired Aquasport 22-foot center console could be a good project for someone. This daysailer looked like the woodworker couldn't stop adding his touches to the boat. Note the rear view mirror for the rower? A 1969 Cheoy Lee Clipper 36 in need of a home. Thankfully the teak decks are gone! Happy Labor Day everyone! Have a great week. 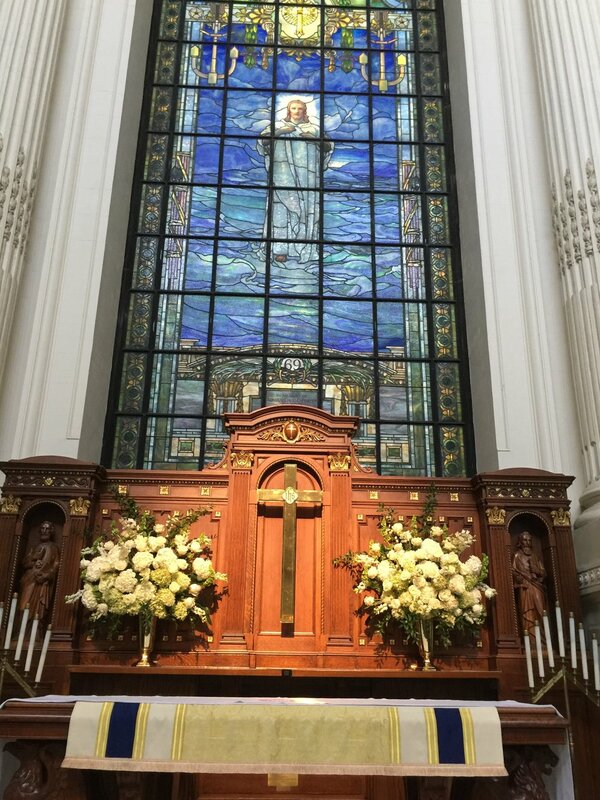 And to share on another note, here are pictures of the altar in the U.S. Naval Academy Chapel for John McCain's memorial service. Laurene led the three-woman team that does the chapel flowers for the week, including the POW wreath and other rooms. Laurene did the altar. They had six weddings planned for Saturday and midweek they really scrambled to switch from the normal bridal colored flowers to something fitting his service. They did a great job. What a special use of her talent!